Auditing has hit the headlines over recent years, and for all the wrong reasons, and in today’s environment, the result of negligent auditing can be serious resulting in sizeable fines and even withdrawal of audit registration which can be costly in terms of fee income. 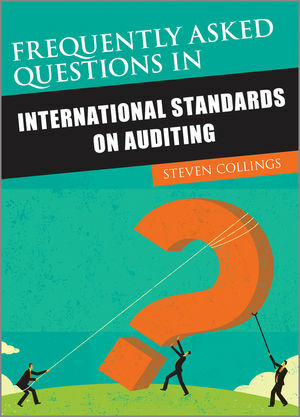 Frequently Asked Questions in International Standards on Auditing presents the relevant standards in a concise and jargon-free way, enabling auditors to appreciate the reasoning behind the standards and undertake audit work effectively. This book focuses on the main areas of the auditing standards and also addresses some key areas where audit firms are failing and which have been flagged up by audit regulators. The FAQs cover the main parts of each standard, and each question will be answered in a practical context, with worked examples showing how the standards are applied in real situations. Steven Collings (Bolton, UK) is theAudit & Technical Partner at Leavitt Walmsley Associates, a firm of Chartered Certified Accountants based in Manchester. He writes extensively on technical matters on Accountingweb.co.uk, and is a partner in the student website, studentaccountant.co.uk. He is also a freelance lecturer to student accountants and to qualified AAT members on financial reporting and auditing issues. Steve is a member of the Wiley Insights: IFRS Editorial Board.